Not all 1.2L petrols are weak. There are some that are fairly competent. Well said. Within the city, I prefer the Sunny's light EPS to the Civic's heavy HPS. I am now left in a dilemma as to whether I should get the new figo or keep my 4 year old champ for a few more years. Please hold on to your 4 year old champ. Whatever replacements you have listed are part of regular wear & tear. How much ever the maintenance cost, holding onto your existing car is much, much cheaper than buying a new car. This is applicable if your car is fundamentally reliable (and not a lemon, like some Skoda Superbs we've seen). Once your car is out of warranty though, it's best to find an expert independent mechanic. He could be 70% cheaper for major replacements. In a market that is steadily moving to petrols, Ford can't afford to focus only on diesels. They have been following this trend since a while and need to change their approach. 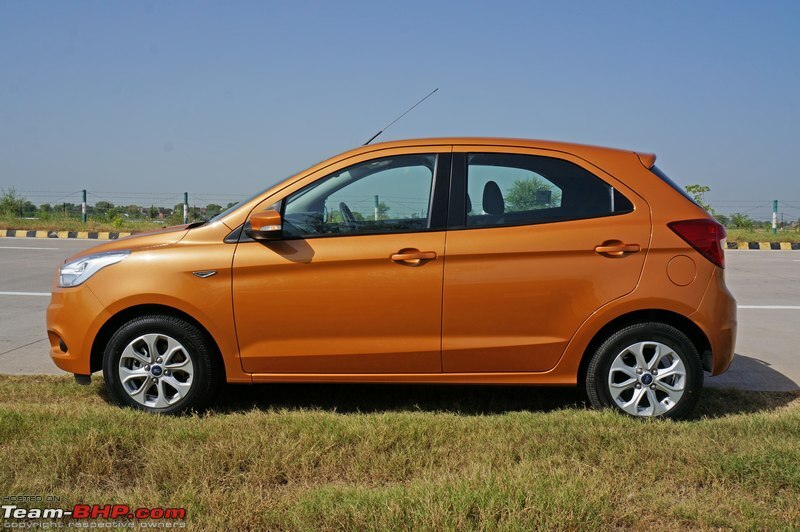 Ford's 1.5L petrol is a rather unimpressive motor, and this 1.2L petrol is lame. Shocking if you consider they've had the best 1.6L petrol in the market. I don't remember if I have seen something similar on T-bhp before. Whatever aspects of the car are identical, the review will be identical. Why re-invent the wheel? What matters most is review accuracy. You'll see the same between the Bolt & Zest, Amaze & Brio, Duster & Terrano etc. So, the reader would like to have all the information in the same thread rather than getting redirected to a different link which takes him to a review of a car in a different segment. Last edited by GTO : 10th November 2015 at 10:08. This is one good looking hatch and interiors look plush as well. Thanks for sharing. I hope Ford will soon extend their auto box to Diesel variants as well. It is clear that the manufacturers are eyeing this segment as is evident from the number of new launches we are seeing lately. It is good for the consumers and they now have a wide variety to choose from. Superb review Rehaan. I have read, watched almost all the reviews about the new Figo that are available out there and no one has covered it so well in such a detailed manner. Goes on to show the amount of hard work you guys put in for each review. Exhaustive details about the 1.5L Vi-DCT automatic variant is more than enough for anyone considering it, just to go ahead and book the car without even taking the test drive. I found the seat height adjustment to have a limited range, lets say when compared to the baleno. Frontal visibility is limited due to this and this could pose a problem for drivers with height below 5.5. I am pleasantly surprised with the suspension setup and I test drove on the same roads that I commute daily through either e2o or the i10 and I could immediately relate to the superior comfort levels it offers. And the ground clearance of 174MM was adequate to tackle some of the worst humps in Bangalore. All credit to Ford India for bringing out such a competent car. While the early upshifts are great for fuel efficiency, they spawn another problem; downshift response times often face a noticeable lag. This is simply because the gearbox is usually in the highest possible gear, often requiring a double downshift in order to provide maximum acceleration. As you might know, dual-clutch gearboxes are designed to shift between odd and even gears, making the jump down 2 ratios take a lot longer (perceived as "gearbox lag" by the driver). Thankfully, at lower city speeds, the transmission can't climb very far up the ratios, so this issue is less prevalent in the city. At speeds of 40 km/h and below, closing a gap in traffic with a slight nudge of the accelerator pedal drops a gear very quickly & seamlessly. However, once you go beyond 50 km/h, you're more likely to encounter this double-shift induced lag. Does the double downshift affects the fuel efficiency in any way or its negligible? There are many stretches on Bangalore's ORR, where the roads are relatively open for hundred metres or so where we can easily touch 60 - 70 KMPH and then drops to almost standstill due to the traffic jams that gets clogged up at each of the junctions. So this condition of double down shift will be frequently evident. Wonderful review. Great attention to detail. Quick question, does the new Figo have Lane Change Indicator function? The New Figo, for me is not impressive from the looks. It feels like a culmination of Grand i10 from front + Micra from side profile to look at. The worse thing that FORD possibly did to FIGO was to choose the same shade for FIGO, as advertised by Hyundai on their Grand I10 hatch. PUNTO EVO is one design that really grows on you and eventually lets you fall in love with it. Personally though, ELITE I20 is the best looking hatch in India today. From what I understand Prodigy07, lane change indicator is considered a standard feature on modern cars and is always part of the design. The last time I drove the Aspire, this was available and had 3 flashes. So I don't see any reason why this may be skipped on the FIGO. Last edited by Vik0728 : 11th November 2015 at 11:59. Yes, it is there. I had used it throughout my Figo 1.5 TDCi test drive. Thank you very much for this very detailed review. Regards the height constraints of the rear headrest and suitability only to shorter passengers, it looks to me to be to be a correct design decision - to suit average height female passengers (and children) who may be occupying the rear seat more often than average height male passengers. As usual, great in-depth detailed review. I test drove an Aspire AT today. Was happy with the drive. AT was very responsive. However, was mildly shocked with the way the doors closed. The sound was like it never shut. Sounded very TINNY. Is this a result of cost cutting? When I got back into my 2008 Altis AT, it felt so much more solid and well built. Yes, its like comparing Apples and oranges. Then, I guess I can never buy a new car at a marginally higher price than of selling my old car and still get the same quality. Do you get my point? Yes, it does have lane change indicator; needless to add it is very convenient. I had the exact same feeling after TD of Aspire and Figo. I even raised the query here in another thread. But to clarify on this point, I am driving the new Figo since 3 weeks and in my car I have not noticed the tinny sound of doors closing. Maybe it was the case of TD cars or something has been changed / improved, I don't know, but sure enough door closing sound is like a THUNK rather than TUNG. Maybe other owners can chip in with their experience. Last edited by teemus : 12th November 2015 at 00:31. 2. The Chrome applique on the boot on the top end trim almost renders the rear bumper moot, by protruding out. Any contact with a vehicle from the back with a larger ground clearance and the Baleno might be toast. All said and done, time for me to book a TD and keep my fingers crossed that Ford keeps pricing unchanged until Early Jan! Once again, a top, top review which answered all my questions and then some that I had not even thought to ask! Wonderful and detailed review Rehaan, Thanks. Saw the car at MPL Ford and disappointed to see the boot size (38 litre difference between old and new figo). Heard that the "Base" variant is only on paper and not available for booking. In my experience, the springy rubber leash attached with fuel cap does not last longer. 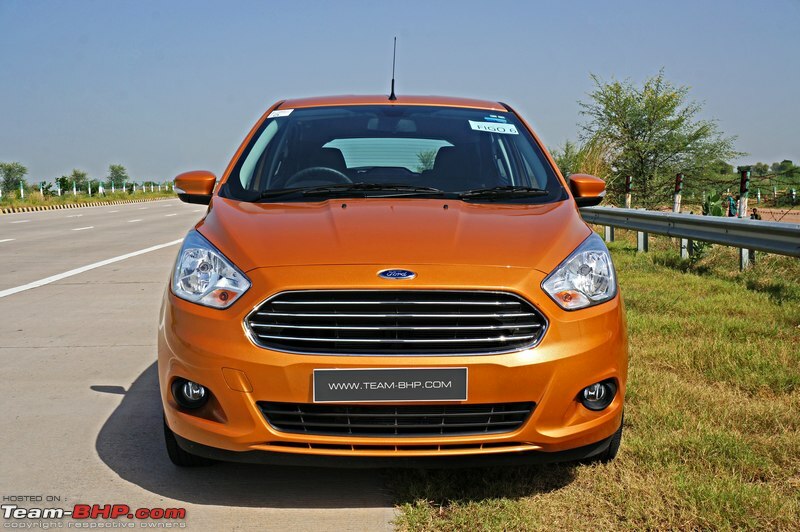 The exterior look, IP, chrome finish, EPS, etc., pushes me to say "New Figo is i20 from Ford". Yes agreed! and that may be the reason for many people opting for Baleno instead of Figo! Very disappointing indeed with the Hyundaic EPS and filmsy built. Eventhough the new Figo has more features, the ford lovers still admire the old gen's Build and the HPS! It won our heart, over the last 5 years. The New Figo, has done a U turn and gone with what it never had, and ditched its key strengths. I felt, at-least 30% of the general buying public would have bought the Figo based on team-bhp reviews and posts. Now, the new one is taking on fierce competition, with no USP of its own. Giving all features is probably not the best selling point. Ask Tata. Saw the new Figo closely and if I were to talk only about her looks, I dont think I liked it. The Figo Aspire looks nice and proportionate but in case of its hatchback sibling, the proportions look pretty out of place, it desperately needs bigger wheels and the Aston Martin front grows on you pretty fast. There should have been more elements to the front. Personally, the Bolt looks much better than the Figo. Anyway, no point in debating as looks are subjective. Excellent review by team-bhp as always !